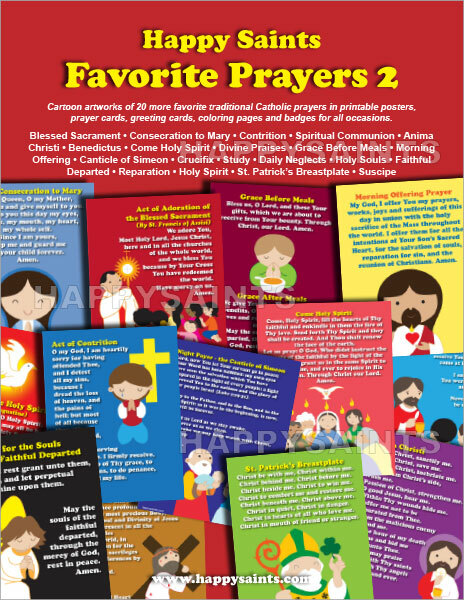 Happy Saints Favorite Prayers eBook 2 features cartoon artworks of favorite traditional Catholic prayers in multiple printable formats i.e. 8 inch x 10 inch posters, prayer cards, greeting cards, coloring pages and badges for countless activities and occasions. Very useful resource to educate and encourage kids and the young-at-heart to pray. Great for parents, teachers, catechists, children and families! 25% off until 22 January 2018. Download the PDF ebook now (no promo code required)!